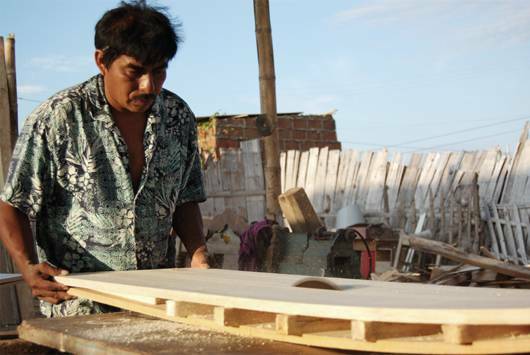 Afro, our «Blank Master» with more than 40 years of Balsa surfboard shaping experience, selects the lightest wood blocks to be manufactured into hollow blanks. For each board six blocks are required. Once they have the right cut, they are glued with planks into the so-called «sandwich». During this process the «scoop-rocker line» is given to the blank. When the blank is separated to insert the stringer, the rails can finally be glued.